Arm your camera with this Tilta camera cage specifically designed for the Canon C300 Mark II. 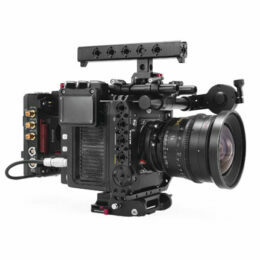 The cage’s top plate includes a 15mm LWS rod adapter to allow you to extend 15mm rods off the back of the rig so that you can attach the Tilta Battery Plate for Canon C300 Mark II or a variety of other accessories. The top handle fits snugly onto the top plate and allows you to comfortably carry or operate off the top of the cage. The Tilta Battery Plate for Canon C300 Mark II Cage (available in either gold mount or V-mount) has a 15mm LWS rod adapter that can be placed on either the top or bottom of the plate to allow you to either mount it off of 15mm LWS rods from the top plate or baseplate. The battery plate provides several different power outputs to allow you to power accessories as well as SDI in/outputs to provide a video feed to monitors or video transmission accessories. The 15mm LWS baseplate allows you to attach various accessories via 15mm rods and can mount to a Tilta Standard Lightweight Dovetail Plate to allow you to easily slide on and off of an operating setup.